After studying this simple tutorial, you will learn many useful and necessary techniques that will help you to create a realistic jeans texture. You’ll learn how to create stitching, apply fabric textures, and create seams using the Mesh Tool. Let’s get started! 1. Create a blank document and set the Artboard dimensions to about 800 x 600px. Grab the Rectangle Tool (M) and create a rectangle which dimensions should be set to about 700 x 415px. 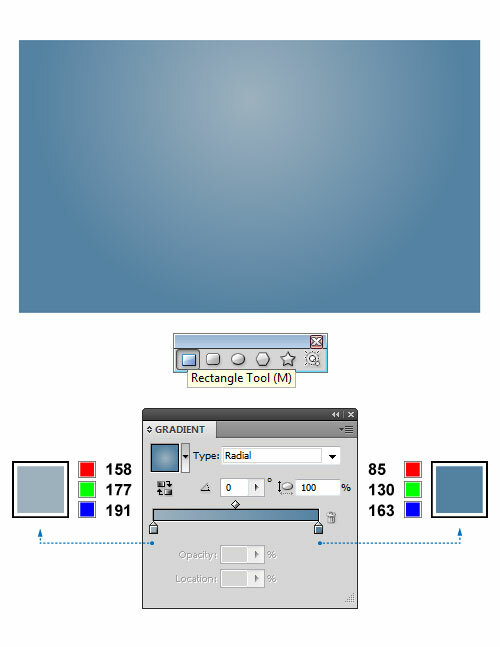 Now, go to the Gradient Panel and fill the selected object with radial gradients as shown below: light blue (R=158 G=177 B=191) and medium blue (R=85 G=130 B=163). 2. Let’s create a realistic jeans texture. Make a copy of the previous object and place it on top using the Bring to Front (Shift+Ctrl+]) command. Go to Color Panel and set the color of the selected object to pure black (R=0 G=0 B=0). While the object is still selected, go to Effect > Artistic > Film Grain… and the dialog box will appear. Set the ‘Grain’ at 12, the ‘Highlight Area’ at 0 and the ‘Intensity’ at 10. Now hit OK to apply the effect. 3. 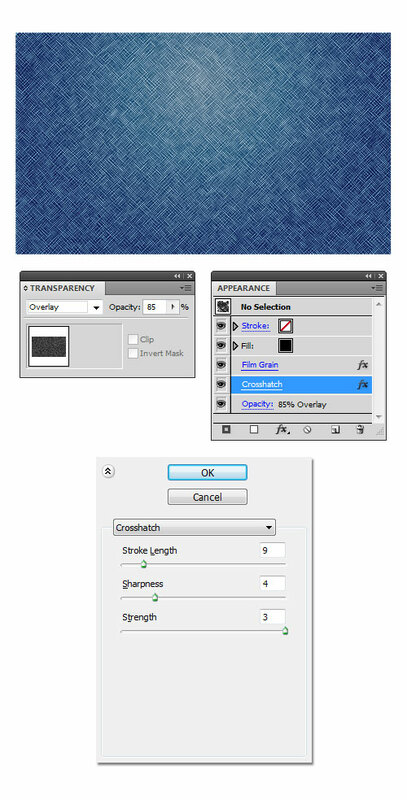 To finish the jeans texture, go to Effect > Brush Strokes > Crosshatch, which brings up another dialog box. Set the ‘Stroke Length’ slider to 9 and the ‘Sharpness’ slider to 4. Finally, move the ‘Strength’ slider to 3 and hit OK. In the Transparency Panel change the Blending Mode to Overlay (Opacity 85%). 4. We are going to create seams on jeans now. 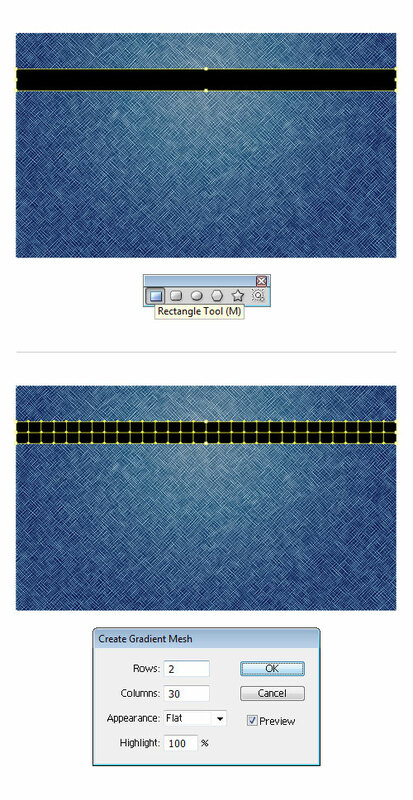 Pick the Rectangle Tool (M), draw a rectangle and set the dimensions to about 700 x 40px. When done, place the object on the upper part of the jeans texture (refer to the image). Open up the Color Panel and fill the object with any color you want (it is temporary, anyway). Keep the object still selected, and go to Object > Create Gradient Mesh… to open a dialog box. Once done, in the ‘Rows’ text field type 2 and in the ‘Columns’ text field type 30. Leave the other settings at their defaults and hit OK.
5. Grab the Direct Selection Tool (A) and select all grid nodes at the top of the mesh object. Pick the color from the Color Panel and apply light grey to them (R=194 G=194 B=194). Then, select all nodes at the bottom of the mesh object and fill them with dark grey (R=79 G=79 B=79). Now, pick the Direct Selection Tool (A) and select every other central node. Once done, replace the existing color with dark grey (R=38 G=38 B=38). Do the same for the rest of the central grid nodes, but now apply light grey to them (R=204 G=204 B=204). 6. To distort the seams a bit, go to Effect > Warp > Arc and the dialog box will appear. In the Style drop-down menu choose ‘Wave’ option and check ‘Vertical’. The ‘Bend’ slider should be set to 1%. In the Distortion section keep the ‘Horizontal’ and ‘Vertical’ at their default values. Activate the Transparency Panel and change the Blending Mode to Overlay (Opacity 100%). 7. It’s time to create some cast shadows for the seams. Grab the Rectangle Tool (M) and create a rectangular shape, as shown on the image below. Open up the Gradient Panel and fill the resulting shapes with the following linear gradients: black (R=0 G=0 B=0) and white (R=255 G=255 B=255). In the Transparency Panel, change the Blending Mode to Multiply (Opacity 100%). Then, draw a long thin, horizontal shape just below the seams. Activate the Gradient Panel and fill the selected object with linear gradients as follows: white (R=255 G=255 B=255) and dark grey (R=51 G=51 B=51). Make sure the Blending Mode is set to Multiply (Opacity 100%). 8. Let’s make our stitches. Grab the Rounded Rectangle Tool from the Tools Panel and create a 20 x 4px rounded rectangle. Open up the Gradient Panel and fill the resulting shape with radial gradients, peach color (R=255 G=236 B=199) and deep bronze color (R=133 G=123 B=102). While the object still selected, go to Effect > Distort & Transform > Transform and apply the shown values and hit OK. Once done, go to Object > Expand appearance, in order to expand the objects. Now place the stiches over the seams, as shown below. 9. Then, go to Effect > Stylize > Outer Glow to open the dialog box. Enter the values you can see on the image below and confirm with OK. To apply some textures to the stitches, go to Effect > Artistic > Film Grain which brings up another dialog box. Set the ‘Grain’ slider at 4 and the ‘Highlight Area’ slider at 0. Finally, increase the ‘Intensity’ to about 10 and hit OK. To finish off the effect, make a copy of the stitches and place them under the previous ones. 10. 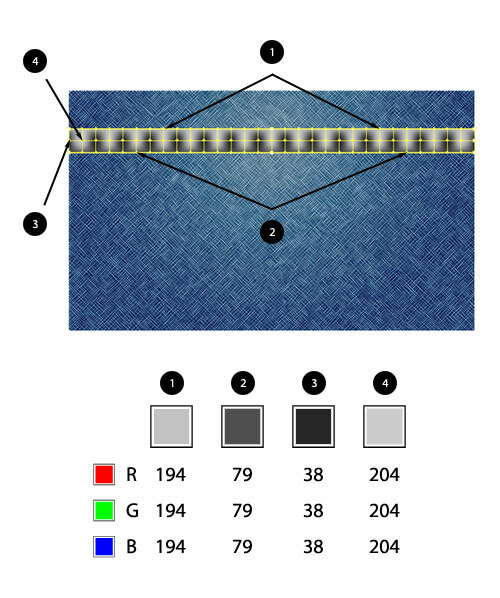 Using the same techniques as described before, you can add more details to the jeans texture, as shown below. 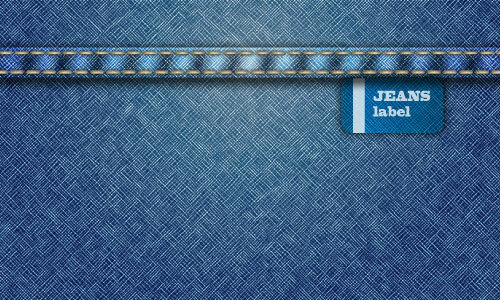 For instance, you can make a label tag hanging out of the jeans, just below the seams. That’s it. I hope you’ve enjoyed this tutorial.